He worked hard to make his dream come true – Bell was a teacher and professor by day who used his evenings to tinker with his project to project the human voice electronically. It was only after years of research that he was given the funding support to pursue his dream full-time. Many people (myself included), have had to work during the day and then pursue their passions during their “spare” time. Do you need to do the same to bring your dreams to fruition? He engaged experts to do things that he couldn’t do himself – Despite his vision and hard work, Bell knew that he didn’t have the expertise in electronics to bring his idea to life, so he hired Thomas Watson as an assistant who could bring skills to the project that Bell didn’t have. You may not have all of the required skills to turn your dreams into reality. If so, is there someone you can hire or work with to assist you? He bet on his dreams – Bell wasn’t the only one working to invent the telephone and it was obvious that the winner of the race would reap a fortune. 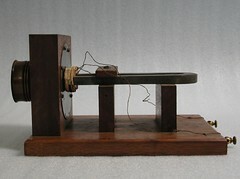 Bell’s patent application for the yet unfinished product was filed only two hours before his main competitor did. He was taking a risk that his theories would work and the risk paid off handsomely. Do you need to jump and build your wings on the ways down? Do you have the courage to put your name and reputation on the line and then the diligence and creativity to make it happen? He turned tragedy into opportunity – Sadly, Bell lost an infant son due breathing issues just a few hours after his birth. Determined to help other children in similar situations, he went on to invent the iron lung, a remarkable apparatus that has saved countless lives and is still in use today. Is there a painful experience in your past that you are able to use to help others? Their birthdays are a day apart. They both have a Scottish heritage (my wife, Karen, is from Scotland). Neither of them was given a middle name at birth. Bell added “Graham” later in life. As we noted these similarities, I was able to remind Hayden that he too is able to achieve something remarkable with his life. Success isn’t granted, it’s claimed. Amazing people like Bell are able to find something to get passionate about and then work diligently towards their goals and there’s nothing to stop Hayden (or you) from doing the same. Extraordinary achievers aren’t that different from you and me except that they are able to clearly identify their best talents, focus their efforts, overcome setbacks, be confident in their abilities, take significant risks and keep going when others have faltered. I don’t know what we would do without our smart phones and we have Alexander Graham Bell to thank for his remarkable invention. What inspires you about Alexander Graham Bell?